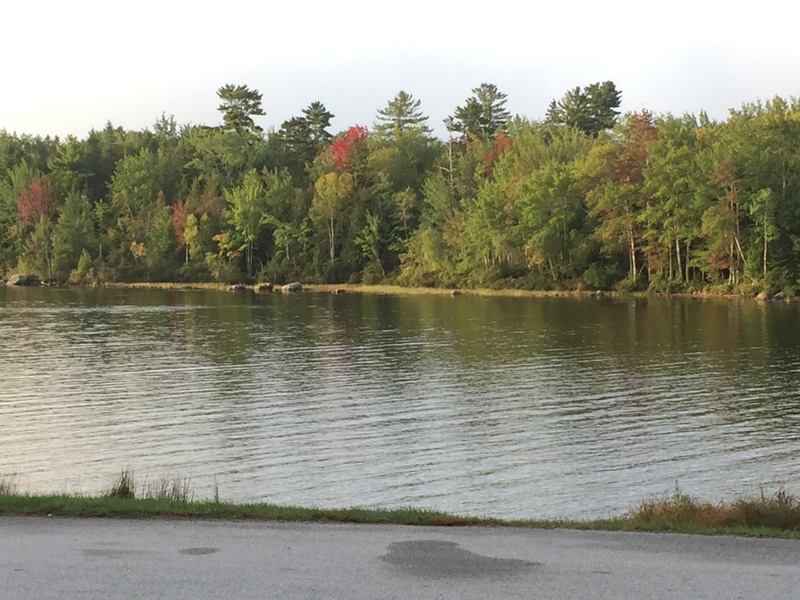 Colour Cottage asked us to post our September dawns. 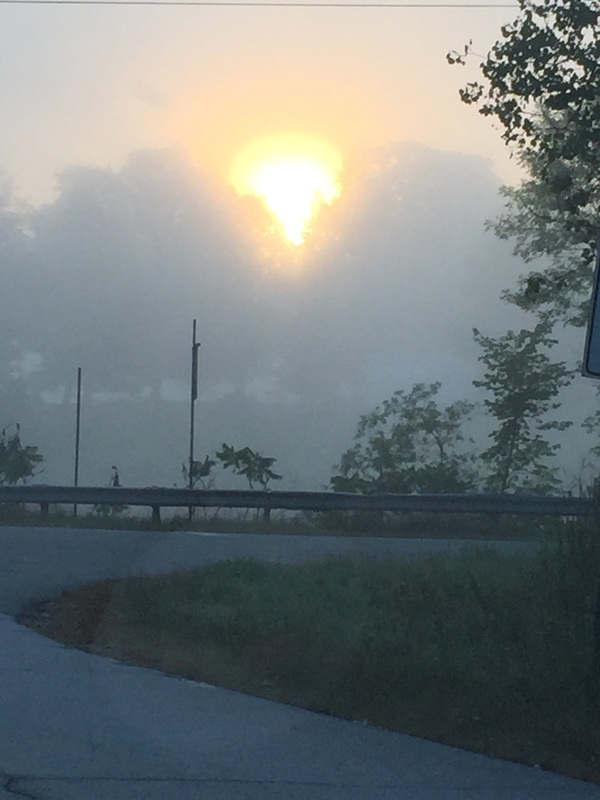 Mine is spent commuting 5 days a week, and so here are a few shots (one of which you have seen) of how dawn looked to me this September. But I also got these shots a few minutes later when I stopped to release a chipmunk. (Have I mentioned I have a squirrel/chipmunk/mouse relocation program going on? I have moved 6 varmints this week alone!) These were taken at Toddy Pond, and I didn’t move – just shot one, turned a few degrees, shot again. Interesting what the different light angles do to the colors! No shots today, it is too dark and rainy. A lot like night around here today. I wonder what October dawns will look like? 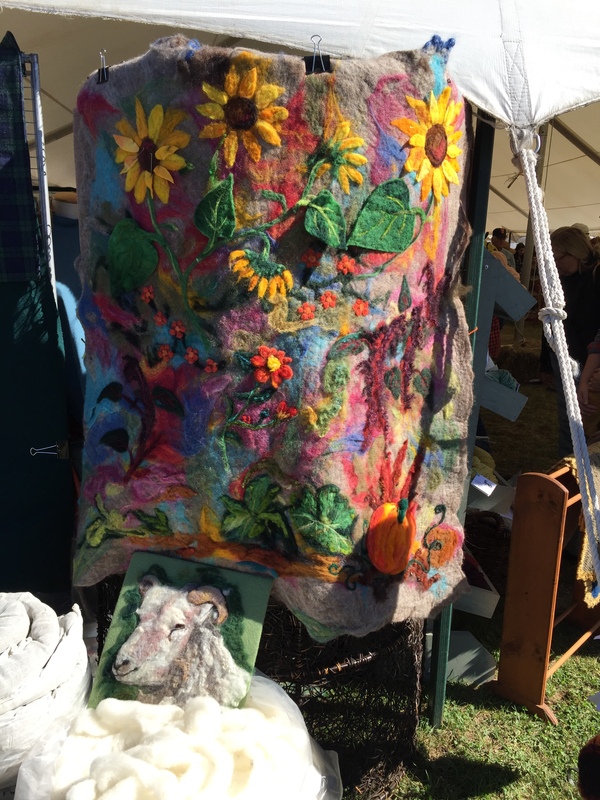 In years past, I have tried to do it all – check out the amazing crafts, the fabulous farmers markets (there are two, one at each gate) the animals, and OF COURSE, the fiber-related things. 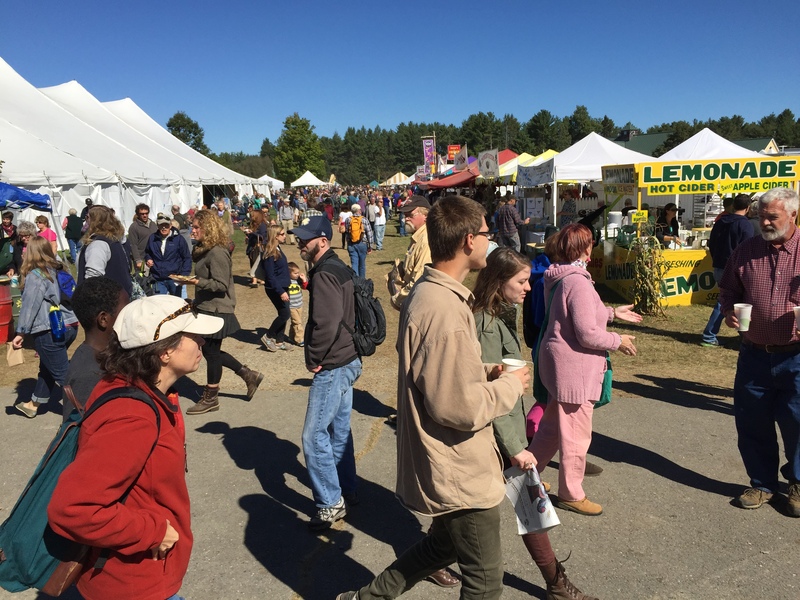 There are also concerts, contradancing, demonstrations, all kinds of energy-related exhibits, and beautiful furniture made by fabulous craftsmen and women. It is amazing! And the food. Heavens, it is good, organic, locally grown stuff. And I usually am half dead by the time I need to leave and find the car, which is miles (it seems) farther away than it was in the morning. Mom is nothing if she is not brilliant, and she realized somewhere on the long drive that we four had different things we wanted to focus on. B wanted to see animals up close and personal. P wanted to shop the crafts booths and farmers markets until she could carry no more. 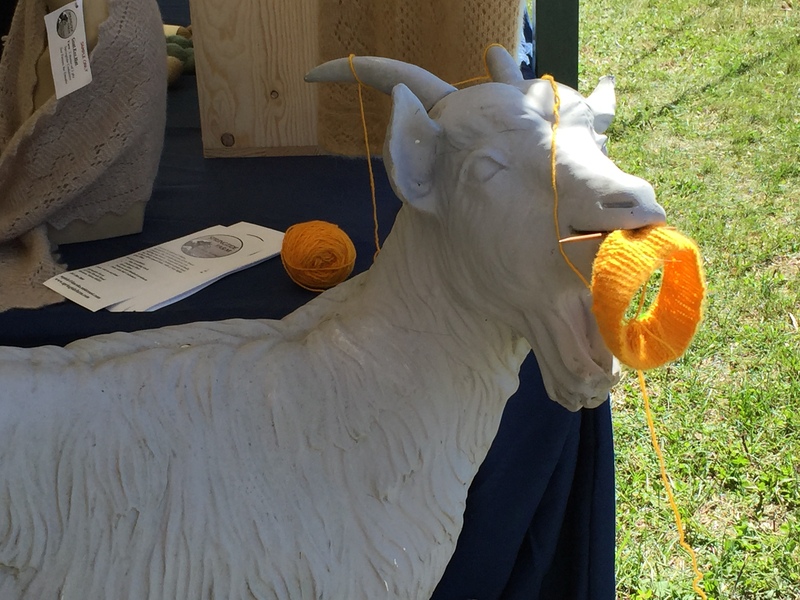 I was all about the yarn. Mom had no agenda except to avoid the usually mobbed craft tents. So she suggested we split up then meet for lunch. Brilliant. We made sure we had phone numbers in case of missed connections, and off we went! She and B settled into a slow and careful animal experience, including a horse drawn wagon ride. P waded into the crafters tents. 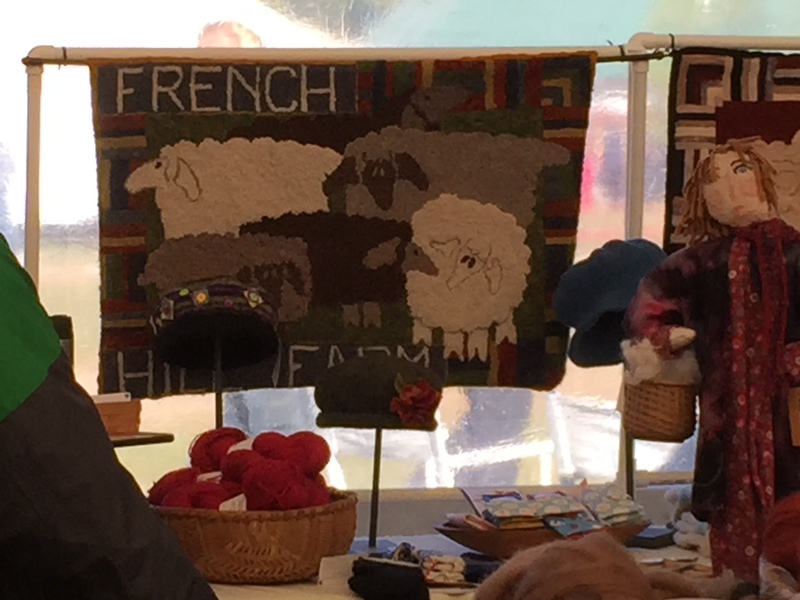 I wasted no time finding the “Maine Fiber Farm” tent. I did remember to take photos of the tent and displays for you. I have no idea who the random shoppers are, but there were many of them, doing what I was – just touching and absorbing the feel of the stuff and the colors. 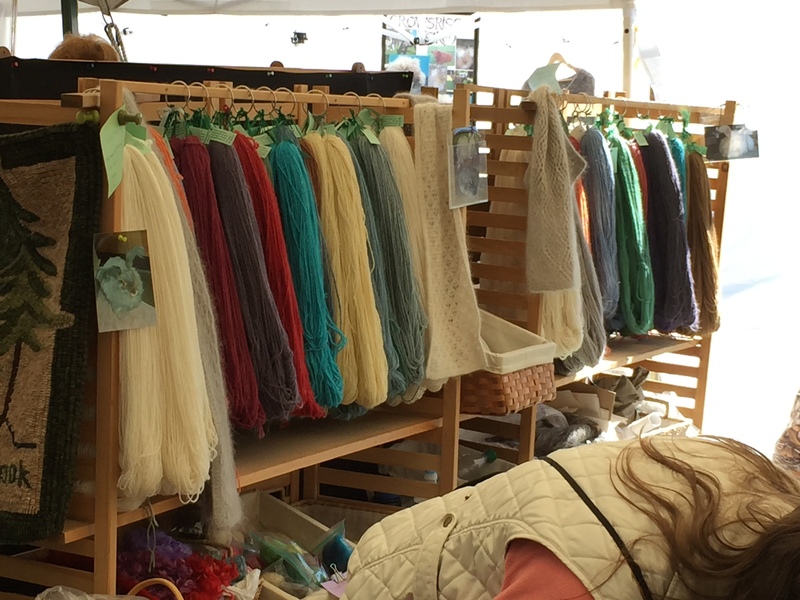 This yarn is cashmere, they also had quiviet – but I took the photo for the screen – lovely carved wood. and look what you can do with it! amazing hats on an amazing hat tree! There were many merchant tents all around the fiber farm tent, I did not get photos of them all, but I did check them all out. And made only ONE unplanned purchase, the bookkeeper is thrilled. 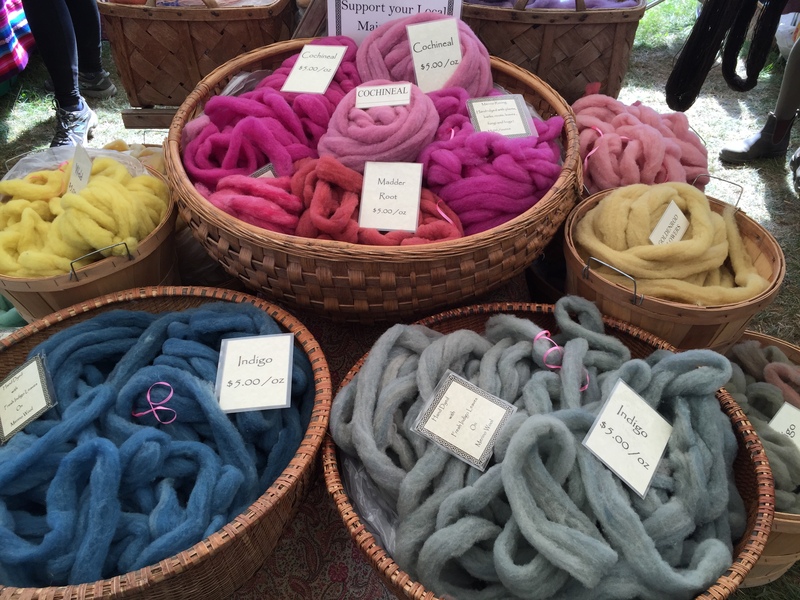 But it was tough, there are so many beautiful yarns made in Maine, and the colors – I need them all! There also was a fleece tent. I went in, wandered through and left, feeling fortunate that I have not yet really learned to spin, because there were some amazing purchases to be made in that tent. Some day. Then it was meet up time in the food area. We all found each other easily, and wandered through the fast-growing crowds in search of the perfect lunch. By now I was getting tired, and so I chose my lunch by the most important factor – shortest line. 🙂 I had a fabulous baked potato smothered in cheese and broccoli, P also got a potato. Mom went for a little bit longer line but more special lunch and got a crab meat roll. it turns out B and Mom had already eaten a huge pile of freshly made potato chips, so B was not hungry. We grabbed our favorite spot to settle – on the little farmhouse steps, and settled in for a long rest. 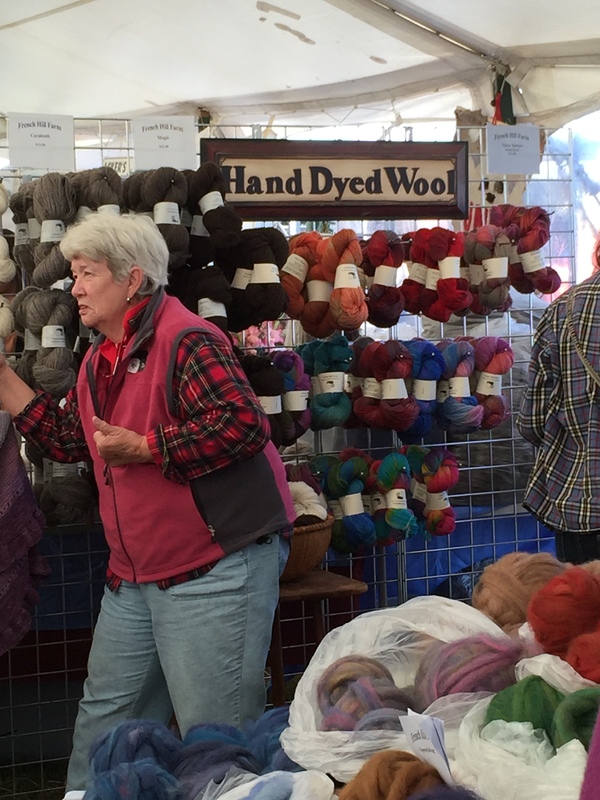 Mom was done with the fair, even though she never looked at a skein of yarn. P had scoped everything out but not bought a lot, she wanted another foray into the crowds. B was enviously eyeing the young women wearing herbal/dried flower wreaths in their hair and thought she wanted one. I was almost out of money, but wanted to be sure to get some maple candy on the way out. So, Mom and I sent P and B off to find their treasures, and Mom and I sat in the shade waiting for them. I had my knitting, so was very content. When they returned, bedecked with flowers and packages, we worked out way to the farmers market for candy, carrots, and a few other things that looked too good to resist. If I thought we had room in the car, I would have bought a fabulous new drying rack. Instead, I grabbed a card so I can get one sometime when we have fewer people in the back seat. We decided to ride the tractor wagon back to the parking lot, but still had quite a hike to the car – I don’t get how the fields grow so big in a mere 6 hours! One thing we either missed or wasn’t there this year was ice cream. Very sad! We got back to Belfast, where we had all met, and P took us to a great place downtown for a small sugary treat before we parted. Our timing was great, as the place was closing for the season on Sunday. 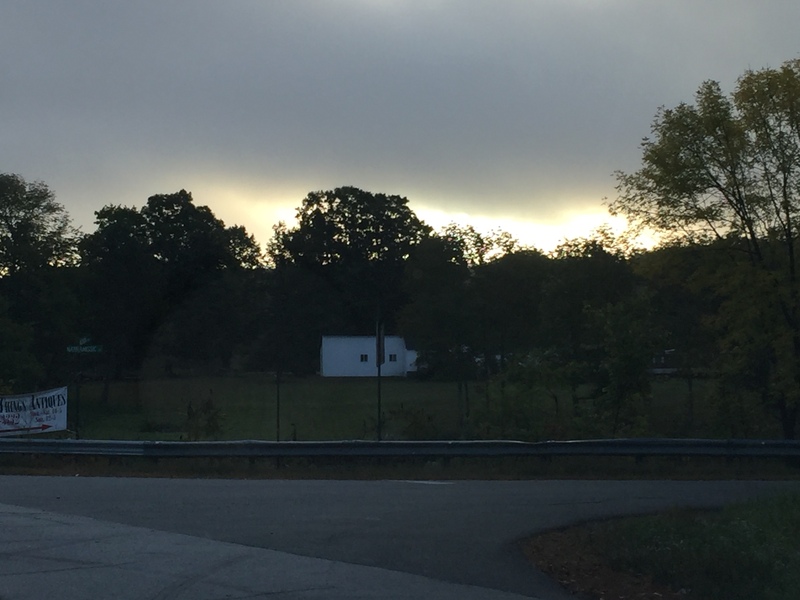 B and I headed for home – tired, but not as tired as I would have been if I had tried to see everything. Another year, I think I will go on Friday again – much less crowded, and I feel like I am able to cover more ground. And maybe before then I will win the lottery so I can buy more yarn. lol. And a wagon to haul it all around in all day. B had a really good time, and loved her animal fix. She came up with a “brilliant” plan, too. Mom should get chickens which are B’s favorite animal, so she could visit them. That way, Mom would have lots of eggs, and B would have pets. And I should get about 20 angora rabbits and a spinning wheel and make my own yarn to save money (little does she know!) She will come help clean the hutches and play with them. As expected, Mom and A nixed these brilliant ideas, and so B will have to get her own house and have all the rabbits and chickens she can handle. Probably more! For the record, the twenty-year-old who laughs at the old ladies (us) for going to bed so early every night went to bed BEFORE us and slept 12 hours. I think she liked the fair. 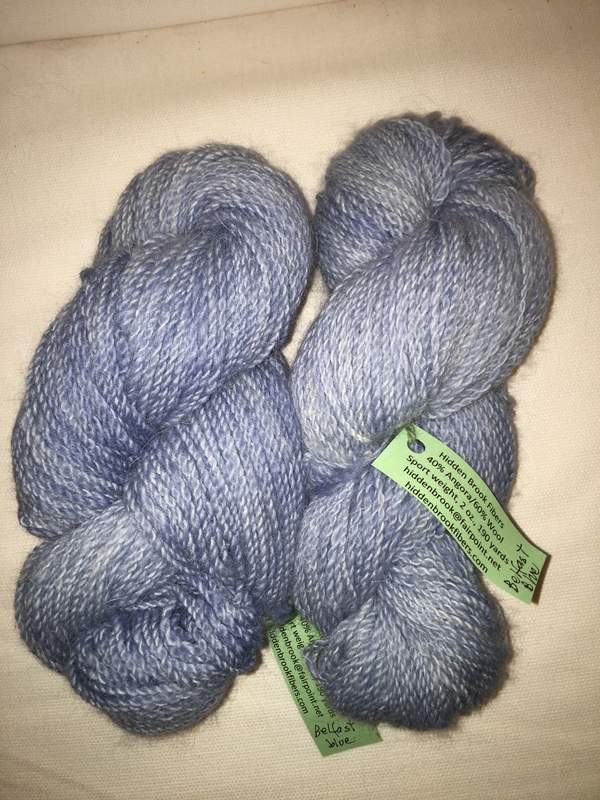 The planned purchase of the blue wool/angora from Hidden Brook fibers in Stow ME. 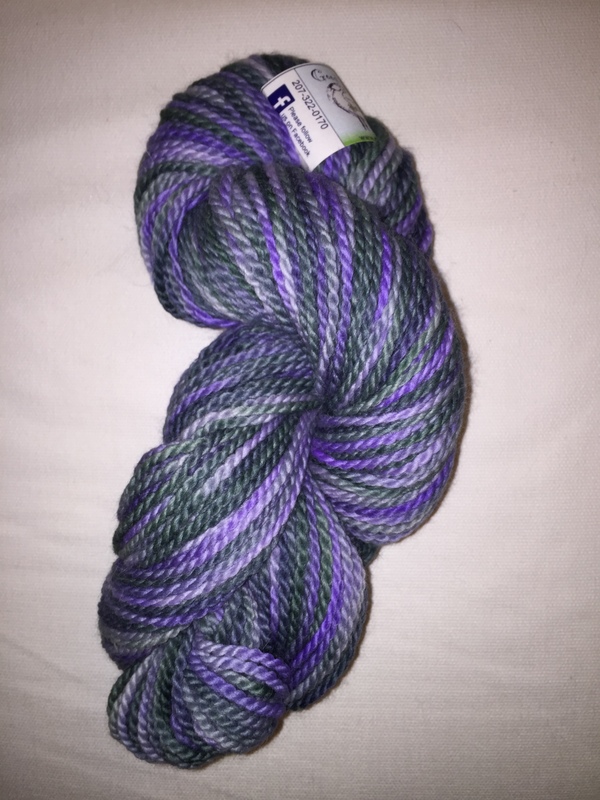 I made a hat with this color last year, and have someone interested in the same hat in a smaller size, so I was glad to find the color. 🙂 Of course this is a phone photo and the color is way off. It is a pale summer sky blue. 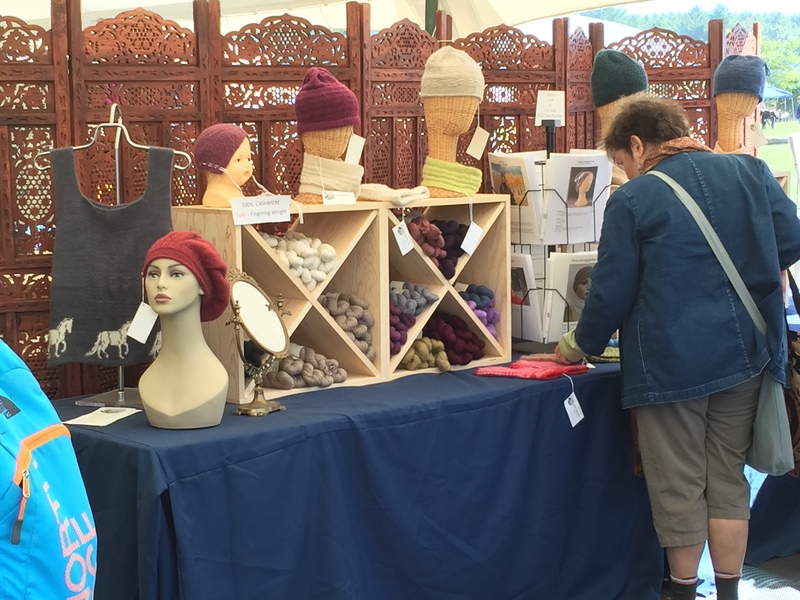 So that is my Saturday fair adventure – I wish you could have come with me – maybe next year? 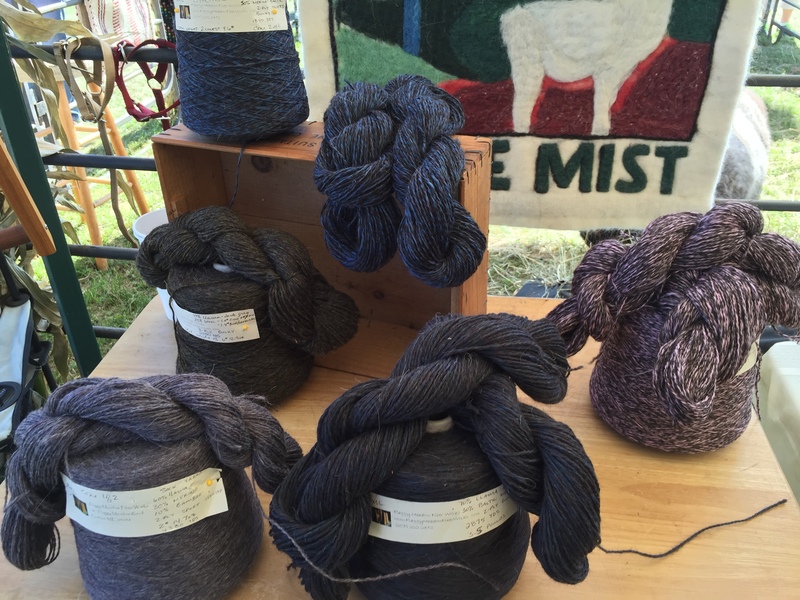 Author salpal1Posted on September 29, 2015 Categories how I spent my day, what I am thinking about making, What I loveTags alpaca yarn, Common Ground Fair, family, food, fun, Unity22 Comments on Fair! Sneaking this in – I’ll only be working half a day today, so I put together a short little list for this afternoon. I’ll also tidy the living room and dining table, as I seem to have smeared my way around the house this week. After that, it is knitting and visiting with her while we make lasagna. A will be home late, but I am sure B and I will fill the time while we wait for her! A few games, some good food, and possibly the last swim of the season. 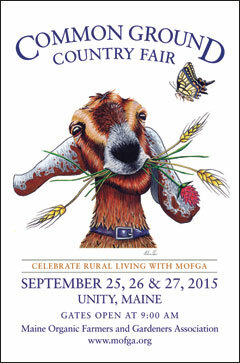 This weekend is the Common Ground Fair “celebrating rural life” put on by MOFGA (Maine Organic Farmers and Gardeners Association.) Niece B has never been, but wants to be a farmer, loves her chickens, and misses all of her pets, so it will be a fun day. I of course will get some yarn. And hopefully lots of photos. 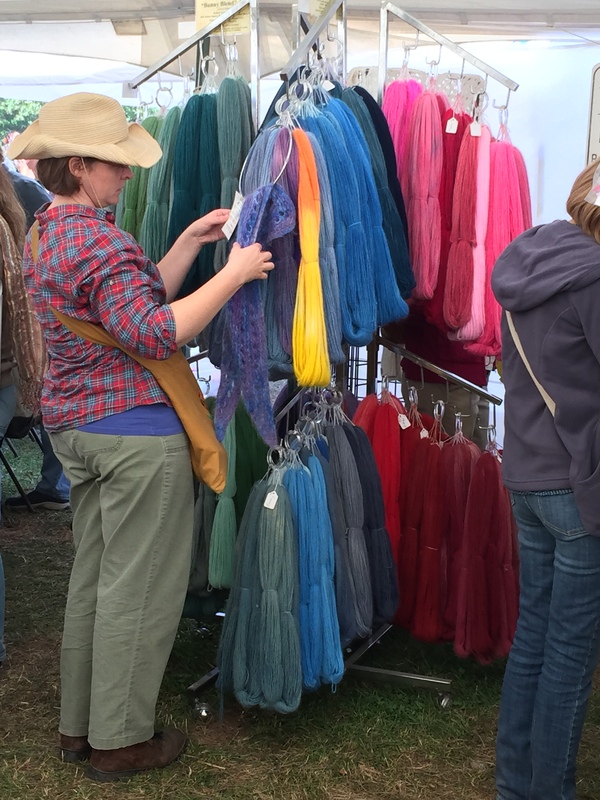 I can’t even begin to explain to you the fibery goodness of this fair, and it isn’t even a fiber festival! there is just so much that is amazing at this thing, I wish I didn’t get exhausted halfway through it. I’ll show you the photos and tell you what was great about it when I write next week. Sunday will be chores, I am guessing, since they have to get doe sometime, right? I want to get a bed ready to accept garlic, which should be planted any time now. And check and see if my little pumpkin is ready to be picked – it is all orange now, but how do I know it is really ready? I have no clue, but will wing it. 🙂 I’ll put the asparagus to bed for the winter as well. Lots to do, might not get it all done this weekend. Or this life time. What are you doing this first weekend of fall? I polished my toenails – metallic burgundy for upcoming fall. This felt like a huge accomplishment. 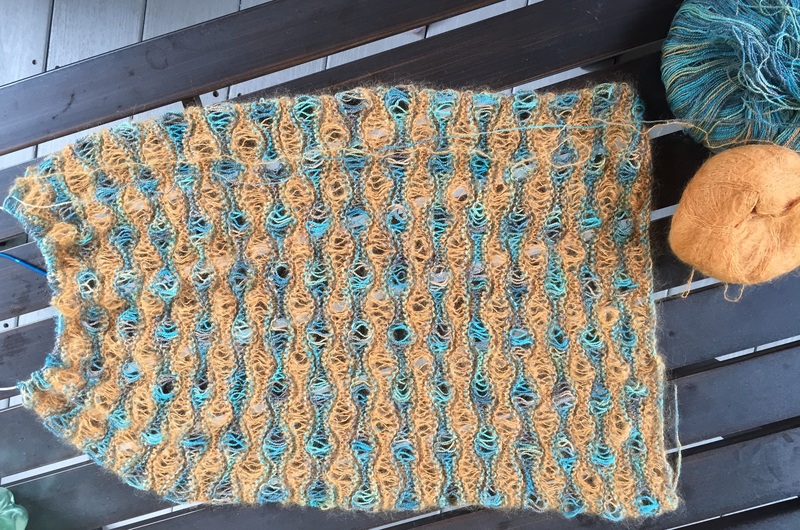 I knit a bit on all projects. I ordered yarn for the toddler sweater. Tosh light in a lovely gray named Composition Book Gray. It will have pink ribbons and buttons. I watched one episode of the Roosevelts (in which Franklin creates the New Deal, and Eleanor begins to find her role) and a mess of Grey’s Anatomy episodes – only two seasons to go to be caught up. I didn’t even scoop a leaf out of the pool. I was the slowest slug I have been in a long time, but it worked and I was able to get up Monday morning ready to face the week. Until A said “There’s no hot water. Will you call the plumber?” Oh, yes, I think I will. Who wants cold showers? Luckily we were not out of propane, so I boiled water for washing, and head off to work just a little cold and grumpy. Luckily it was the latter, and I had no flat tires, so I drove on to work, and had the mechanic here fill the tires. All 4 were a little low, likely because of the change in temperature this week. I was glad to get through the day and know there are only 4 more of them. Plus, I get a half day off Friday because I worked an extra half day last week. Yahoo! I did call the plumber, they did fix the hot water. Today is a better day already. After such a restful and rejuvenating ten days of vacation, going to work this week felt like a shock. It was hot and humid, and so after work, it seems all I did was go for a swim, then collapse on the couch with my knitting. But I didn’t even do much of that, I just felt exhausted! Then to add insult to injury, Saturday was one of our big fundraising events – a tennis round robin. It is lots of fun, and I was in charge of the money box and raffle ticket sales, so I was busy, but had time to talk to people throughout the day. A is off with her sisters to go to their aunt’s for a family birthday party – I begged off when the plans were made, knowing what this week was like. So, I have a whole day with no expectations. Rather like my Fridays used to be. Working on reformatting and editing the rough draft of a memoir my mom is writing about her work life – WOW! I am so excited that he undertook this project. Even if it is never officially published, it is an amazing thing for her to have pulled together. I’ll write later this week and let you know what I chose. 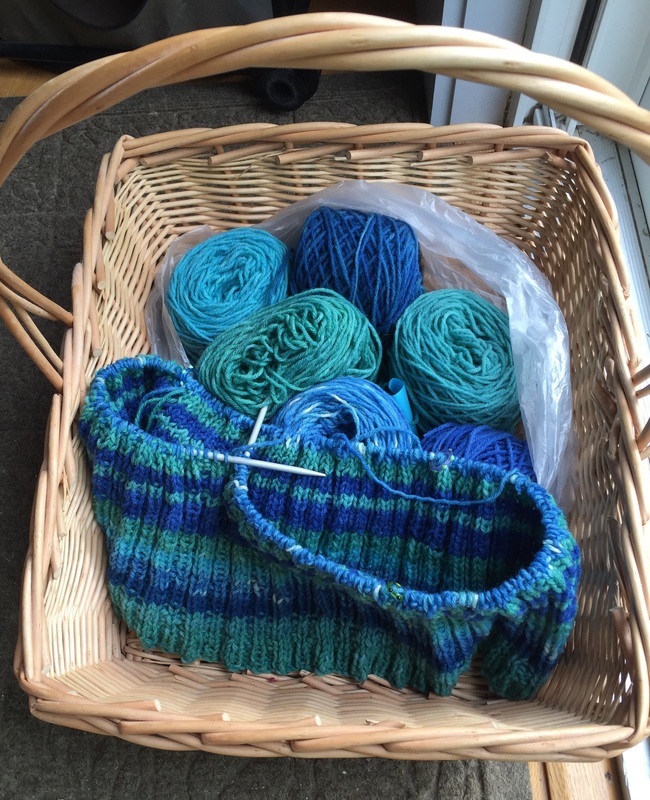 Meanwhile, here are some knitting update photos. Photos are done with the camera, I think they came out pretty well! This is the striped blue/green vest. Colors look better than the last photo I shared with you. 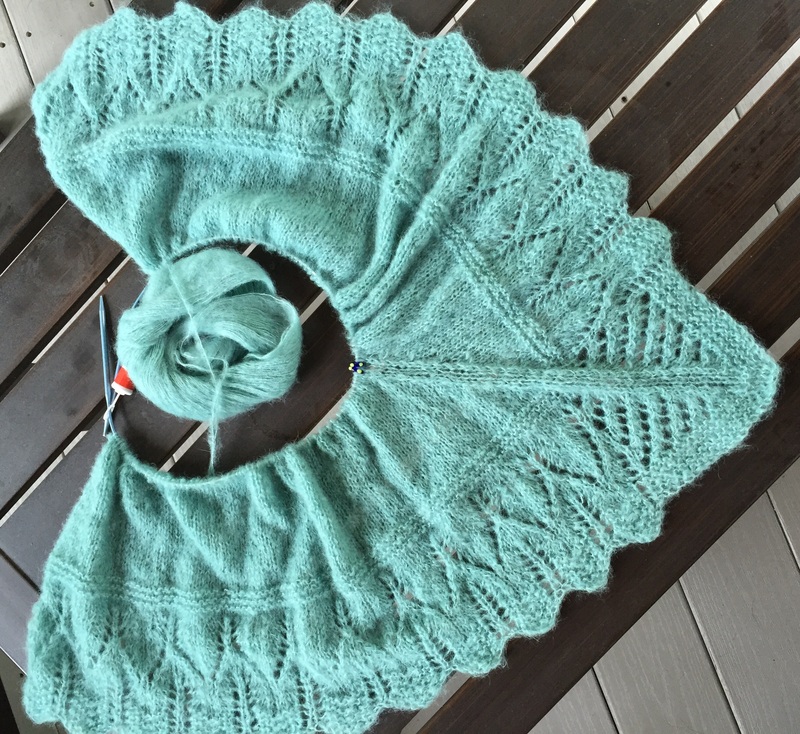 Millais – about half way through the yarn, so, hopefully, the shawl as well. I LOVE that the rows are shorter by ten stitches with each 4 row pattern repeat – rows are going along quite quickly now. The color in this photo is also better than the previous one I posted. Oh gosh, I nearly forgot to tell you the big news! I sold the little dark reddish-orange Charleston Sweater and hat set! I have had it on Etsy since I finished it, and apparently this is the season to sell a little sweater. 🙂 I am very happy about this sale as I was getting discouraged at the lack of sales all over the place. I have started putting some hats back on Etsy, as it will get cold eventually, right? I also got in touch with the woman who runs the holiday pop up shop and she is doing it again this year. I will be in it again, and from day one this time. 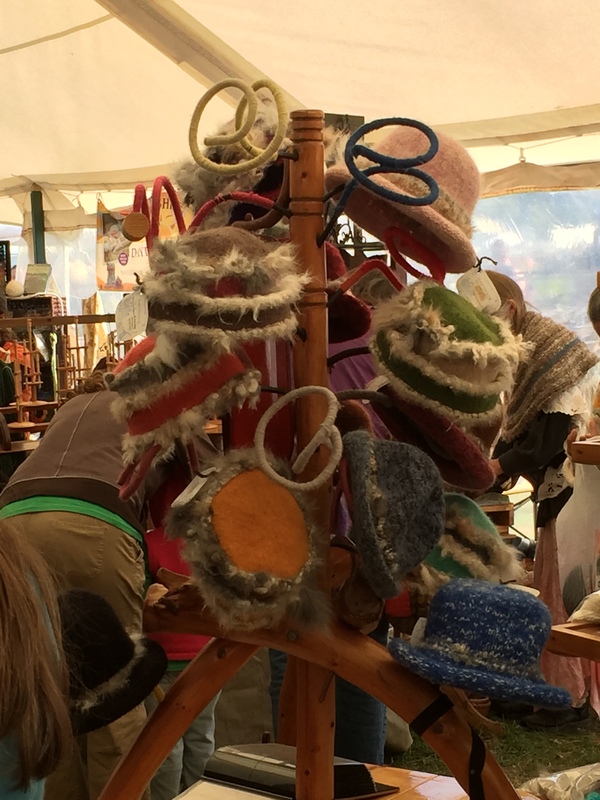 I have to start thinking about inventory – but I have been collecting some beautiful buttons this summer, so I have inspiration for more hats and one button wraps. I’ll fill the shop and Etsy and see what happens. You know, when I finish these things in process for myself. 🙂 And the commission Charleston Baby set that has been on order all spring. I FINALLY got measurements out of the mom, so now just need to get a yarn commitment from her so I can begin. I know I will never make a living at this rate, but it sure is fun to get paid to knit! Well, time to go do one of the things on my list… maybe I will choose a polish color and then take a nap. I have been up for 5 hours now. Don’t want to get to ambitious. Author salpal1Posted on September 20, 2015 September 20, 2015 Categories how I plan to spend my day, what I am making, what I am thinking about making, What's on my needlesTags Charleston set, Etsy, knit, long week at work, to-do list14 Comments on What weekend? 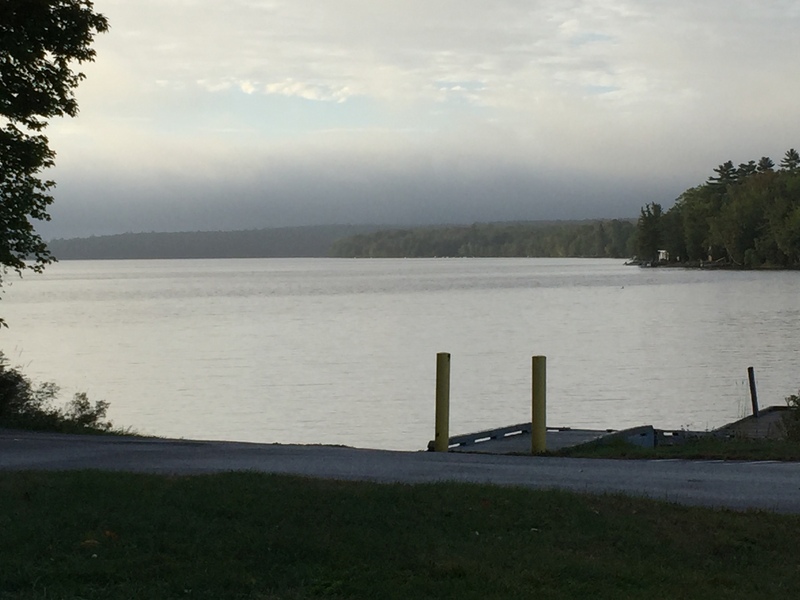 Warm humid days and cool nights = morning fog. If I could have taken more photos as I was driving, I would have, it was just beautiful with sunlit fog in all the valleys along the way. And now it is sunny and hot. Like summer. Fabulous September weather! How quickly the week has gone! I wonder why work weeks don’t go this fast? Today A and I are going to be busy. We are headed up to Bangor this morning to pick up a rental van, then it is down to Ellsworth for a few errands including the shoe store. We are both in a search for the perfect shoe (very different definitions of these shoes of course) and not having much luck. We are picking up pizza from Finelli’s and heading over to see Crimson Crow. We will exchange lunch for a bookcase, it seems a good deal! Then back home. If it stops raining we will gather our big dump items in prep for a trip tomorrow. Until this week our method of vehicle management has worked well. Own and maintain small fuel-efficient cars for regular use, then rent a larger vehicle or truck only when we need one. But this week that didn’t work as planned. There were no trucks for us to rent. So, we will make do with a van. Might mean a couple of trips, I guess. When we get home, it is back up to the sewing room. I finished the bodice and sleeves of the dress. Things went really well on the sewing front. But on the fit front – not so well. I know the pattern said negative ease. It also said to trust it. My measurements were one the low side of the range so I did in fact trust it. I have blocked enough things to know that if you pull a knit in one direction, it will shrink in the other, but I kind of thought that they would have planned for that. And maybe they did on a flat chested woman. Which I am not. The bodice barely comes down over my bra! So, I look on this as a muslin or toile or test sew or future rags, whatever you want to call it. Future efforts will be wider and longer. It’s probably just as well as I didn’t do a super job of lining up the plaids. I might be the only one to notice, but I would have. What are you doing this rainy Friday?